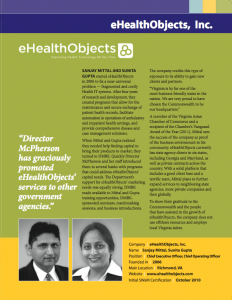 Sanjay Mittal and Sunita Gupta started eHealthObjects in 2006 to fix a near-universal problem — fragmented and costly Health IT systems. After four years of research and development, they created programs that allow for the maintenance and secure exchange of patient health records, facilitate automation in operations of ambulatory and impatient health settings, and provide comprehensive disease and case management solutions. When Mittal and Gupta realized they needed help finding capital to bring their products to market, they turned to DMBE. Quickly DirectorMcPherson and her staff introduced them to several banks with programs that could address eHealthObjects’ capital needs. The Department’s support for eHealthObjects’ marketing needs was equally strong. DMBE made available to Mittal and Gupta training opportunities, DMBE- sponsored seminars, matchmaking sessions, and business introductions. The company credits this type of exposure to its ability to gain new clients and partners. A member of the Virginia Asian Chamber of Commerce and a recipient of the Chamber’s Vanguard Award of the Year (2011), Mittal sees the success of the company as proof of the business environment in his community. eHealthObjects currently has state agency clients in six states, including Georgia and Maryland, as well as private contracts across the country. With a solid platform that includes a good client base and a terrific team, Mittal plans to further expand services to neighboring state agencies, more private companies and then globally. To show their gratitude to the Commonwealth and the people that have assisted in the growth of eHealthObjects, the company does not use offshore resources and employs local Virginia talent.